We were thinking about our travels abroad for last week's Finance Fridays and the new EU mobile roaming charges. We're still thinking about our travels this week by looking at some of the hidden, sneaky or excessive charges you could encounter at airports. Once you have stepped inside the airport you are a captive market and it seems ready to pay out for anything! 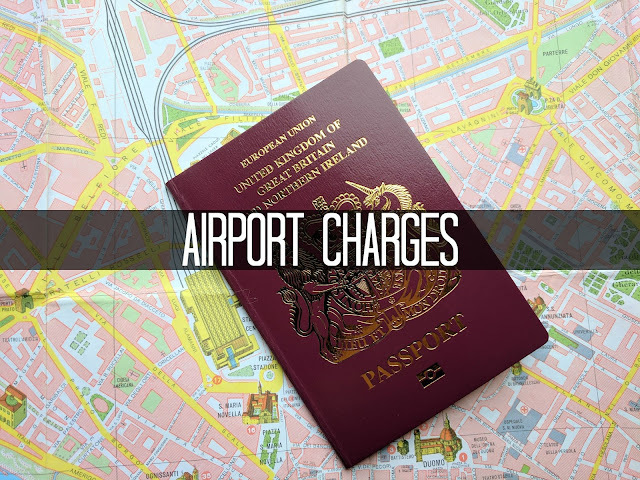 There are some airport charges which you might find hard to avoid but you'll need to be prepared for. For others if you plan ahead you could save yourself some money. We haven't even mentioned VIP or luxury lounges in our list! Trolley fees – If you're travelling on your own you might get away with pulling or carrying your own luggage through airport. If you do need to get a trolley you may find you are charged for using one. In some airports, such as Cardiff, they work like supermarket trolleys so you get your money back when you return it. However in other airports the fee is non-refundable. At Manchester the fee is a £1 coin or a €2 coin (I'm not sure which kind of £1 it takes!). Birmingham charges the same but if you don't have the cash and use a credit or debit card an additional 40p charge is applied. At Luton and Bristol the price for using a trolley goes up to £2. WiFi – You can spend a lot of time in an airport now as you need to check in so early and there's also the possibility of delayed flights. Whether to pass the time or catch up on business a decent WiFi connection is a must. Gatwick offers up to 90 minutes free before you will need to pay and at Luton you get a whopping 4 hours. However at Cardiff it is a measly 30 minutes before a £3 per hour charge applies. Look out for other places at the airport which will offer free WiFi such as McDonald's or Wetherspoons. Smoking – As airports are public buildings it is illegal for people to smoke inside the terminals. Most offer designated smoking areas before you check-in with some allowing you smoke outside once you passed through security. At Leeds Bradford and Belfast International you will need to pay £1 to use the smoking shelter after you have gone through security. Weighing luggage – Excess luggage can cost you a lot in charges especially if you have to pay on the spot. If you get to the airport and think you may need to ditch or decant the contents of your suitcase before you check it in. Be warned though as it seems the standard price to use the weighing scales at airports is now £1. Departure lounge fee – Believe it or not but some airports are now charging for using the departure lounge even though you can't fly without going through it! At Durham Tees Valley the charge for the 'Passenger Facility Fee' is £6 per adult and £2 for each child aged between 3 and 15. Dropping off – We all know that airport parking can be expensive but many airports also charge for cars just dropping off friends and family. At Stansted the charge for staying 10 minutes is £3.50 with an additional £1 per minute charged for up to 15 minutes. After 15 minutes it goes up to £25. At these prices it could work out cheaper to park in the short stay car park or arrange to meet or drop off outside of the airport complex. Have you been caught out by airport charges? Do you plan ahead to avoid them? Prices and charges correct at time of publishing. Please check with the airport before travelling for current charges. If you want to join in with this week's Finance Fridays then add your link to the linky below. Any post concerning financial matters is allowed. Full details here. It doesn't have to be published today as you have until 23.55 on Tuesday 4th July 2017 to join in. I'm surprised at some of the charges to be honest. I never use luggage trolleys, but I'd expect them to be free and I'd be fed up to be charged, although I'd be happy for them to be on the same basis as supermarket ones. Free wifi is a basic for me these days, although I probably wouldn't use it in a UK airport as I have an unlimited mobile data package and that's probably faster anyway. £1 to use the smoking shelter??? Seriously?? Wow I did not know that. The departure lounge fees and the dropping off ones are simply ridiculous! The drop off fees make me see red. It's really sad to see where our world us going. Oh my goodness I hadn't heard of the departure lounge fee before - that's terrible!